At its 50th Anniversary, the Free Speech Movement at U.C. 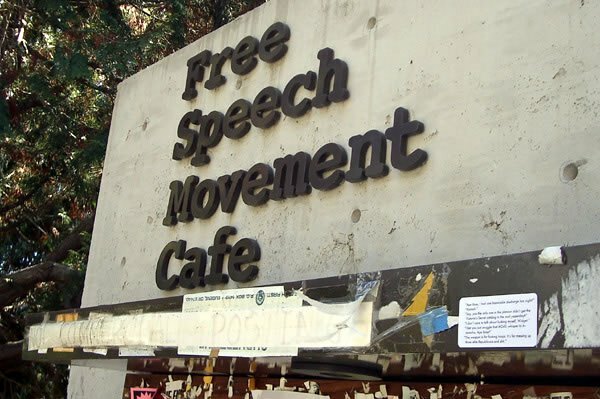 Berkeley has become a nostalgia brand easily invoked to mask how intolerant the student body, like those in so many other prestigious ivory towers, can be of speech it finds intolerable, says one of the FSM veterans. On the brighter side, the latest annual survey by the Knight Foundation shows, for the first time in its 10-year history, young people generally more supportive of the First Amendment than their teachers. Another survey by the First Amendment Center shows that Americans generally are increasingly supportive of students’ rights to speak and report as much as anyone else. A strong majority of Americans believe that high school students should be able to exercise their First Amendment rights just as adults do. The percentage of those who support this statement increased over the past year from 75% to 78%, while the percentage of those who disagree with this statement decreased from 23% to 19%. A growing majority of Americans (68%) agree that public school students should be allowed to report on controversial issues in their student newspapers without the approval of school authorities, while only 27% disagreed. When the question was first asked in 2001, Americans were almost evenly split on the issue and those who strongly disagreed with the statement dominated the response. We see a large change from 2001 through 2007 and into 2014 . . .
One can only hope that these college-bound students have as much respect for diversity of views when speakers are scheduled to appear on their campuses with unwelcome things to say. We all have the right not to be indoctrinated by the government to accept its version of history. But to show ourselves worthy of this liberty we should also stand ready to hear, or at least allow others to hear, messages that clash with our own self-indoctrination.